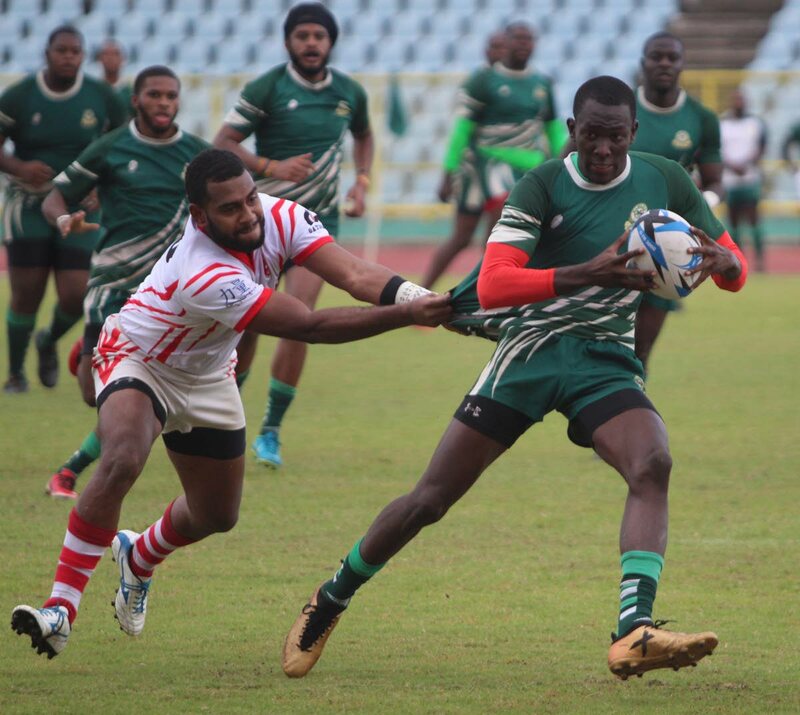 Harvard's Joseph Quashie, rights, looks to shake off the tackle of a Caribs opponent in a TT Rugby Football Union championship division clash last year. DESPITE no guarantees the Ministry of Finance will release funds for TT's participation at 2019 Rugby Americas North (RAN) 7-A-Side Tournament, which takes place in June and July, TT Rugby Football Union (TTRFU) president Collin Peters, who described himself as the "eternal optimist", said training began yesterday. Some 22 players began "field work" training yesterday at Caribs' Pitch, Queen's Park Savannah. The pre-selected team is dominated by 11 Harvard players, including Shakeel Dyte, Nigel Ballington, Wayne Kelly, Joseph Quashie and Aasan Lewis. Peters said there may be further changes as selection was based off players' performances during the TTRFU sevens circuit last year. The RAN event serves as a qualifier for the 2020 Tokyo Olympics and Peters believes this will be the factor that leads to the distribution of the requested funds. He said, "They haven't released funding yet. They said they were looking at funding. We have made the request to the Ministry of Sport, who will subsequently make the request from the Ministry of Finance. So we are going ahead of the planning. We cannot wait to hear if yes or no." In a recent exchange between the Sport Company of TT (SporTT) and the TTRFU, SporTT executive manager Anthony Creed said funding to the sporting organisation will be for the purpose of assisting teams in reaching major events such as World Championships and Olympics. In a letter to the TTRFU, Creed had said, "This is to advise that SPORTT will pursue funding for the Rainforest Women's Sevens which is carded to be held in Costa Rica during the period 14th-18th February 2019 as preparation for Pan Am July/August 2019...TTFRU request for funding for RANs fifteen in Guadeloupe from 16th to 28th March 2019 will not be considered." However, the TTRFU boss said the union has opted to forgo the sevens tournament in Costa Rica because of the close proximity from the request for funding and the date of the tournament, which ended yesterday. He said the team would not have been able to prepare properly enough to give a good account of themselves. Asked about the possibility of funding not materialising for the men's RAN sevens event, Peters said, "I am an eternal optimist. And they've (Sport Company) already said they're not looking at the 15s programme, they're just looking at the under-19s programme. They're not looking at the women's 10s programme, in which we are the defending champions, and we are almost sure that we would have won the Under-19s programme and we were ahead in the 15s programme. Right, so now there is nothing going forward from those programmes to say like a World Championship or anything like that. "What they intimated is that they were only looking at things that had a CAC, Pan Am, Olympics, World Championships (end result). But I am the eternal optimist and I am thinking that yes, we're going to get funding for the sevens programme, which is a qualifier for the Olympics and of course the women go to Chile for the Pan Am Games." Rugby sevens events at the 2019 Pan American Games will take place in Santiago from July 27-28. The women qualified after winning silver behind Mexico at the 2018 RAN Women's Sevens in Barbados. Reply to "TT sevens team starts full training"